The studio will be open this evening. Come for the last of the Christmas cookies and a glass/cup of something to ready yourself for whatever partying you might be doing tomorrow. And make some art if you want to. Since the weather put the kibosh on Last Minute Tags and Gift Garni, I'll get out the raw materials for that. Well, actually, it's all still out. I'm stopping by the University Book Store on the way to the studio and will pick up some tiny calendars, if they still have any. You know, the itty bitty month-to-a-page calendars that you see glued to old advertising cards and kindergarten projects? They're just a perfect size to add on tags and Art Trading Cards. If you've never made trading cards, this might be a fine time to give it a whirl, as Daniel Smith is hosting an all-comers ATC swap on January 11. Maybe we should go en masse? More info this evening. Well, first it was going to snow and it didn't. Then it was going to snow and it did. Some people think it's going to snow tomorrow and some don't. Everyone seems to agree that the snow we have is going to stick around and turn to ice and driving will be an ordeal. Soooo, I think there will be no Art Party tomorrow. If by some miracle all the snow is gone and the streets are safe I will be there making tags and gizmos. You're welcome to come; call first to make sure the studio is open: 206-853-2513. ...maybe best forgotten! It was an underwhelming show; many of those who had done it before said it was a complete about face from years past. They took home as much as they sold previously. Whether it was the economic anxiety or the change of venue - who knows? But, there's stock for my Etsy shop, which is now open. Click on the contemplative couple to your right to go there. I will be adding more collages over the next few days. Last night was the Phinney-Greenwood art walk. 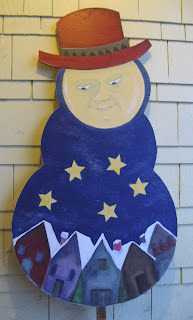 It included a fund raising auction of yard-art snowmen, to benefit the Greenwood Boys' and Girls' Club. The blanks were donated and then handed over to volunteers to paint. Here's mine. The preview of the Forgotten Works Challenge show was last night, which means the show opens tonight at the Tashiro-Kaplan Building in Pioneer Square. 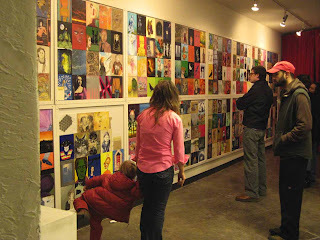 There are five or six walls like this - 1,500 pieces in all - mostly paintings, some collage and photography. Each one is $40. And 30 of them were made by me. 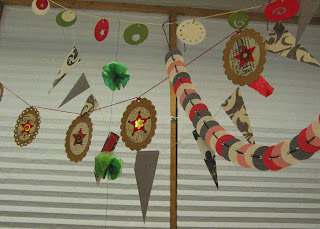 And here are some garlands (not really forgotten) from Tuesday night's Art Party. Once you start making these, it's hard to stop.